Recap of Super Group Triple-Header from Cotton Bowl Stadium | Dallas Cup, Inc.
DALLAS, Texas (Sunday, Mar. 25) – The Dr Pepper Dallas Cup, the oldest and most prestigious international youth soccer tournament in the United States, kicked off Sunday. The full day of action was highlighted by the Gordon Jago Super Group triple-header at the historic Cotton Bowl Stadium. The triple-header kicked off at 12:30pm with a matchup between defending Super Group champions FC Dallas and the Premier League’s Arsenal FC. In the 9th minute, Arsenal connected on the opening goal of the match. After sending the ball down the wing, a driven cross was sent into the box that landed at the foot of Folarin Balogun’s, putting the English side ahead 1-0. After some back and forth play on the pitch, FC Dallas leveled the match in the 26th minute. After an overlapping run from his right-back position, Jorge Almaguer delivered a stunning strike from well outside the box that flew past the Arsenal keeper. The match remained knotted 1-1 until the 65th minute when Arsenal struck again. Bukayo Saka sliced his way through the FC Dallas defense, settled the ball on his left food, and curled the ball into the upper corner of the goal for a spectacular goal. The match ended 2-1, with Arsenal collecting their first three points in Bracket C play. The second leg of the Super Group triple-header featured two-time Super Group champion EC Vitoria squaring off against 2017’s Super Group runner-up CF Monterrey. Juan Machado, who made his CF Monterrey senior team debut this year, scored the first goal of the match in the 26th minute. After splitting through the Brazilian defense, Machado guided the ball calmly into the back of the net with a clinical finish. Rayados added a second goal in the 40th minute to make the score 2-0 going into halftime. The match remained 2-0 until the 82nd minute when EC Vitoria grabbed a late goal from a set piece. Vitoria’s visible size and strength paid dividends as the ball was swung into the box, eventually landing at the foot of Ruan Vitor who tapped it into the back of the net. The match ended 2-1 as Rayados picked up three points to begin their 2018 Dallas Cup campaign. 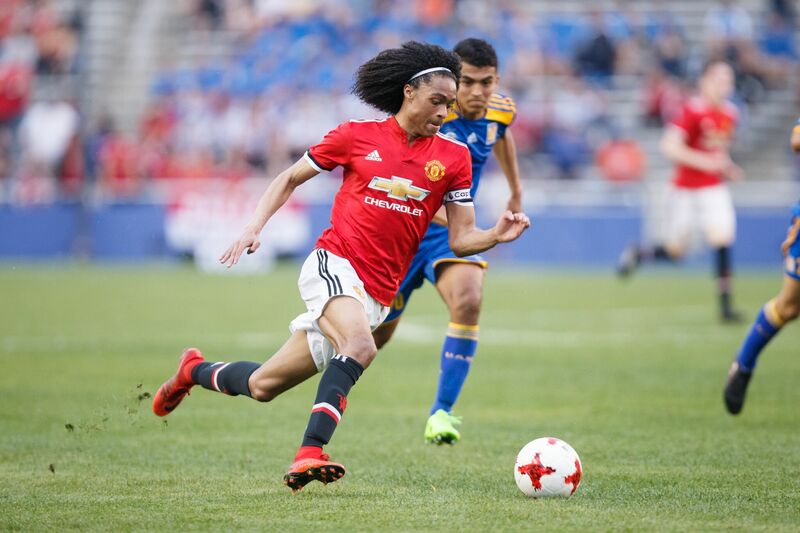 Following the Dallas Cup “Welcome World” Opening Ceremonies, the marquee match of the day took place between the world-renowned Manchester United academy and prestigious Liga MX side and two-time Super Group champion Tigres. In front of a Dallas Cup opening day record attendance (Event attendance: 20,644), both sides created chances as they bolted around the Cotton Bowl stadium field. Tigres scored the first goal of the match in the 30th minute. A well-swung corner kick from Tigres landed at the back post where Aldo Mota tucked the ball into the back of the net. Both sides continued to create chances within the back and forth action, but the match remained 1-0 until the 73rd minute. After Tigres applied pressure in the United box, a loose ball was deflected into their own goal by a Manchester United center back, putting the Mexican side up 2-0. The Red Devils continued to look resilient however and in the 77th minute, Mason Greenwood connected on the team’s first goal. The English side continued to apply relentless pressure and in the waning minutes of the match, James Garner delivered a beautiful left-footed finish to make the match level at 2-2. Both sides continued to look for the winning goal in the dying minutes, but the final whistle blew with the match knotted 2-2. Dutch national and Manchester United academy standout, Tahith Chong, was awarded the Toyota MVP award. All streams will be live on www.dallascup.com and the Dallas Cup FaceBook page.